Sylvester | Meet The Ambassador | RAPTOR Inc.
Great Horned Owls are one of the largest species of owls in North America and are sometimes called “Tigers of the Sky.” Sylvester weighs 3lbs., has a 48″ wingspan and is 22″ tall. 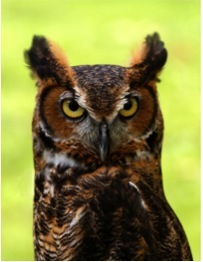 In the wild, Great Horned Owls prey on everything from kinglets, to blue herons and even other owls. Sylvester came to RAPTOR Inc. in 1997 with wing and leg fractures caused by a car strike in Lawrenceburg In. Sylvester’s size and colors are striking and he always impresses the audience at programs.